News - The Ilion Little Theatre Club - Ilion, N.Y. Thanks to all who attended our auditions for the comedy Drop Dead! Please keep an eye on this space for any upcoming audition announcements at the Ilion Little Theatre! 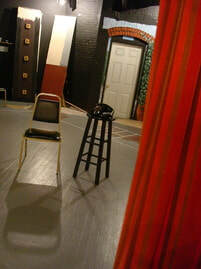 A tradition still upheld many decades later is the social aspect of the Ilion Little Theatre. While the organization continues to produce shows for the general public throughout the year, the organization's members meet once a month to socialize at a pot luck dinner at the theatre. Each dinner meeting is held the third Thursday of the month (unless pre-empted by a scheduled performance), every month, from September through May. General organization business is conducted during these meetings, but both current members and those interested in joining are invited to attend. The next monthly dinner meeting of the "Ilion Little Theatre" is tentatively scheduled for Thursday, May 16 at 6:30 pm at the theatre (also referred to as "The Stables"), located at 13 Remington Ave, behind Remington Arms. A social period (BYOB) will be held from 6:30 to 7:00 pm followed by dinner and those attending are asked to please bring a dish to share. The date is subject to change.